Like the school kid slumped at her desk, eyes averted, palms sweaty, praying that the teacher won’t summon her to the chalkboard, the United States sits at the back of the global classroom fidgeting uncomfortably under the glare of its peers. Once unrivaled as the world’s top producer of research scientists and engineers, and uncontested as the leader of commerce and industry, the U.S. now lags in the critical areas of science, technology, engineering, and math (STEM), ranking 26th among developed nations in mathematics literacy and 21st in science literacy according to the Program for International Student assessment (PISA). In order to restore its leadership and global competitiveness, the national workforce must dramatically increase the number of employees skilled in math and science—and for those up to the challenge, opportunities abound. The U.S. Department of Commerce (USDC) projects STEM jobs to grow by 17 percent from 2008 to 2018, compared to 9.8 percent growth in non-STEM occupations, with STEM workers earning 26 percent more and experiencing a much lower rate of joblessness. However, despite these prospects, interest wanes. Why? Business executives, industry leaders, politicians, and economists largely agree that the problem and solution begin with education. "Our responsibility as Christians and educators is to make sure our campus and our programs reflect the broad diversity of the Kingdom and encourage all students to explore possible careers in STEM fields." -Joshua Morris, Ph.D. However, improved skills and increased knowledge among educators solve only part of the problem. Students’ fundamental lack of interest in STEM subjects presents an equally challenging obstacle. Many schools now appeal to children’s natural curiosity, beefing up their STEM curriculum and incorporating interesting, relevant, hands on programs that engage students early and often. Some sponsor field trips to companies that rely on science, technology, engineering, and math to expose kids to potential careers. Others promote job shadowing, allowing high school students contemplating a college major to experience a day in the life of a STEM professional. APU sponsors an annual event in honor of the national Brain Awareness Week effort that includes activities at local middle schools. Skyla Herod, Ph.D., associate professor in APU’s Department of Biology and Chemistry and the event organizer, partners her neurobiology students with more than 750 seventh graders, encouraging hands-on learning and natural discovery with puzzles, trivia, take-home games, and exhibits. “At APU, we also cover issues of gender and ethnic diversity in STEM subjects and talk with our student teachers about how to promote math and the sciences to the next generation, including the tenacity to stick with it,” said Kaiser. From asking kindergarteners “What do you want to be when you grow up?” and encouraging them to consider the possibilities in STEM fields, to connecting high school students with STEM mentors and role models, to taking advantage of nonprofit programs that provide supplemental teacher training, these efforts can shift the cultural perspective and lead to a more balanced representation in colleges and universities. Yet some ethnic minority groups remain consistently underrepresented in science and engineering degree programs. The U.S. Department of Commerce's Economics, and Statistics Administration reported in 2011 that Hispanics and African Americans account for only 6 percent of STEM workers, but 14 and 11 percent of overall employment, respectively. “We find that students in general, but minorities in particular, are underprepared for rigorous STEM studies,” said Joshua Morris, Ph.D., associate professor in the Department of Biology and Chemistry. “Our responsibility as Christians and educators is to make sure our campus and our programs reflect the broad diversity of the Kingdom and encourage all students to explore possible careers in STEM fields—especially those who think they don’t belong or don’t have a chance.” As APU faculty seek external funding for programs to support ethnic minority students, they continue to develop and implement best practices such as small class sizes, open-door policies, and genuine investment in the lives of their students. Economic forecasts point to a need for producing, over the next decade, approximately one million more college graduates in STEM fields than expected under current assumptions, according to the February 2012 report from the President’s Council of Advisors on Science and Technology. Private institutions like Azusa Pacific lead that charge, producing more students who pursue science majors and doctorates in technical fields than their larger public counterparts, according to the March 2014 report from the Council of Independent Colleges, Strengthening the STEM Pipeline. Several factors contribute to this, including the low ratio of students to faculty, the higher number of full-time faculty with Ph.D.s, and the opportunity for undergraduate students to engage in hands-on research with their professors. This personal attention and focus on scholarship enhances the rich culture of science, mathematics, and research at APU. “STEM enrollment has steadily increased in both numbers and as a percentage of the total enrollment since 2008, and the six-year graduation rate for STEM majors keeps pace with the total graduation rate,” said Chris Olson, Ed.D., APU’s director of institutional research. 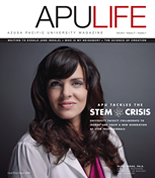 These stats reflect a concerted effort to bolster STEM education at APU. Bryant Mathews, Ph.D., associate professor of mathematics who earned a coveted invitation to the Project Kaleidoscope (PKAL) Summer Leadership Institute in summer 2013, explored education challenges, discussed institutional change hurdles, and created leadership growth plans. Now he shares those insights with his APU colleagues and incorporates new methods into his curriculum. Mathews also focuses on promoting STEM careers by raising student awareness of career options, involving more students in summer research and internships, and increasing student involvement in STEM professional conferences and career days, student-to-student mentorships, study-skills workshops, and informal gatherings with professors. “As the math program at APU has grown, we’ve added more rigor and depth,” said Mathews. “We are excited about how these changes enable us to give our students a solid mathematical foundation, and we’re eager to see them enter graduate programs and careers that build on their undergraduate training.” This shot in the arm not only gives all APU students an advantage, but given the ratio of female to male students, it also positions the university to infuse the marketplace with much-needed, skilled women. According to the USDC, although women hold nearly half of all jobs in the country’s economy, they hold less than 25 percent of the jobs in science, technology, engineering, and math. Furthermore, even women with a STEM degree prove less likely than men to actually work in a STEM field, choosing education and health care more often. In addition, this approach to research allows students to develop deep relationships with faculty members and fellow students, contributing to a more meaningful education and a higher retention rate in the STEM programs. Graduates armed with this powerful blend of firsthand experience, high-level math and science literacy, and solid Christian worldview enter the workforce well-equipped to represent the U.S. as leaders in the global marketplace. The John Stauffer Charitable Trust awarded APU a 1:1 challenge grant of $500,000 to support the summer research program for chemistry and biochemistry undergraduates. To be raised by January 1, 2020, the funds will establish a $1 million endowment. Originally published in the Fall '14 issue of APU Life. Download the PDF or view all issues.